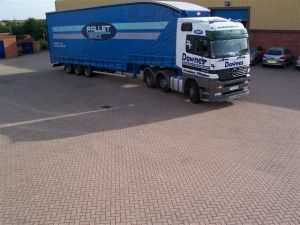 Downes Transport have teamed up with Pallet -Track and become a shareholder member in 2006. We cover the local postcode area's of RG and SP delivering and collecting with a fleet of vehicles ranging from articulated to tail lift smaller vehicle's and vans. This has enabled us to invest in more information technology. All our pallets are bar-coded, allowing us full track and traceability of your consignment. This is also backed up with a dedicated website for POD retrieval within 24 hours of delivery. If you are looking to dispatch 1-5 pallets then the pallet network is the most cost effective way also offering next day or economy service. > same day collections ( untill 5pm ) of palletised loads of various sizes & weights.